KATIE: Merry Christmas everyone, Katie & Waffles Too here. WAFFLES TOO: Um, hi everybuddy. Santa came! Santa came! I'm not sure who Santa is, but he came! KATIE: Our Secret Paws came too and we'll tell you all about it once Glogirly photographs the loot! WAFFLES TOO: Um, Boss? Are you gonna tell them about our Christmas movie? You know, the one for Gloman? KATIE: We have something cool for you today. Waffles Too and I have been in the studio this week working on a top secret project for Glogirly. She wanted to do something really special for Gloman. WAFFLES TOO: And she needed OUR help. KATIE: Well, she needed MY help. Yours is more of a supporting role. WAFFLES TOO: I love supper rolls. KATIE: Glogirly's always saying she's the luckiest girl in the world. You'd think is was because she has ME, the best cat in the world. KATIE: She says she's the luckiest girl in the world because she married Gloman, her best friend. WAFFLES: Boss? Will you be my best friend? KATIE: Baby steps, Waffles. Baby steps. Now onto the show. Click above to play or Watch HERE on the GLOGIRLY YouTube Channel. Happy Holidays from our Townhouse to yours! May your new year be bright with laughter and love. Pawsome guitar and drums guys. And a very sweet video! Merry Christmas! That was wonderful. We particularly loved the backup singers. Very well choreographed we thought. What a terrific video. We hope Gloman is super surprised. We haft say, the musicians were the best part, especially the drummer. Waffles, you have a future as a rock band drummer. Merry Christmas to all in the Townhouse.!! MERRY CHRISTMAS, Katie, Waffles TOO, Glogirly and Gloman! You rock those drums Waffles Too, and Katie is of course as always breathtaking! Merry Cristmas to all of you! We wish you another 10 x 10 x 10 years of happiness and love! Merry Christmas to you Miss Katie ! So nice, kitties! Congratulations for the job and congratulations to Glogirly and Gloman, it is so sweet to see two people happy together! & a bi warm thank you for your friendship. That video was just amazing - I bet Gloman loved it! We certainly did over here!! That was the coolest video you guys! It made the Momma have a little happy tear. She says she's gonna pay it for the Daddy cause he is her best friend. Happiest of Christmases to all of you. Merry Christmas to all of you from Allegra, Ruby and me! Wow! That's fantastic! Merry Christmas! Wonderful movie and Merry Christmas to all of you! woo hoo! ::wildly clapping paws:: Pawsome video! Katie, if you and Waflles Too can work things out, you'd both have a future as a band :) Wishing all of you a Merry Christmas! That was sure fun! Merry Christmas from all of us at Brian's Home! Merry Christmas dear friends. What a great movie and superior music. You guys really rock! Awww that brought tears to my eyes!!! LOVED IT! I bet you made Gloman's Christmas with that..adorable! Merry, Merry Christmas to ALL of you! 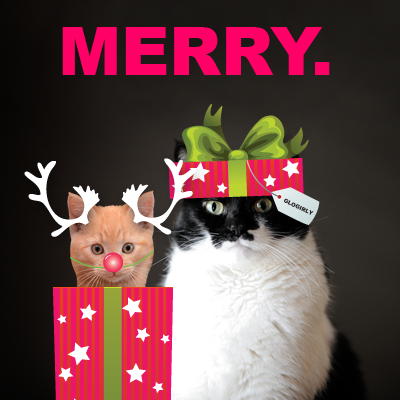 Meowy Christmas from the ManxMnews family! That is a great video. Merry Christmas to all of you. Awesome! This was really great! Absolutely FABULOUS! Our Daddy sings that song for Mommy...not very well, but still! Merry Christmas from The Horde at the Katnip Lounge! WOW!!! What a cool video!! Merry Christmas to you all! The title wasn't referring to me??? What a cute video. TW had never heard that song because she's never had a best friend. Happy Christmas to you and the Glopeeps. *clapping paws* That was pawsome! Waffles...you have a future as a drummer! That was very sweet and such a thoughtful gift. Katie, although you were great strumming the strings, Waffles Too kinda stole the show. Again. That was a great video! We know Gloman had to love it. We loved the musicians too!! Awwww, that made me very teary - SO SWEET!! Hope you all had a very merry Christmas!! My Mom&DadKatt said they both married their best friend too and that's the advice they give their nieces if they ever get married someday! We hope ya'll are feeling better & managed to have a good Xmas despite that! Ooh we can't wait for mommy to get home so we can watch it!! Is It Live Or Is It Photoshop?? ?